Gage Elementary School in San Carlos officially unveiled a neuromasium on Wednesday, a classroom that combines physical fitness and academics. 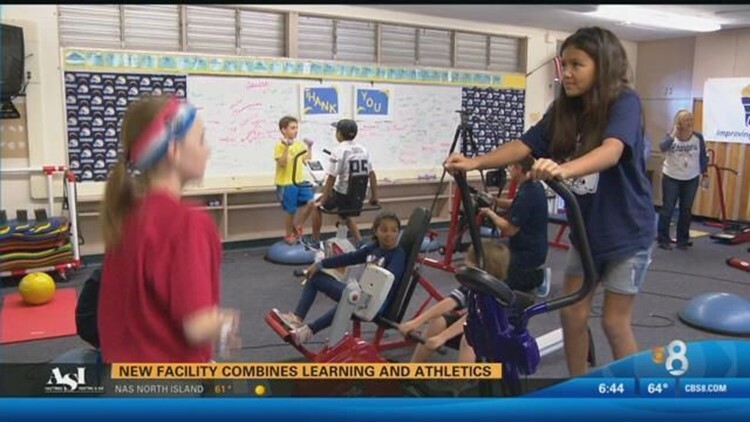 SAN DIEGO (CBS 8) - Gage Elementary School in San Carlos officially unveiled a "neuromasium" on Wednesday, a classroom that combines physical fitness and academics. Various stations are set up throughout the room where kids do math or science while they exercise. School officials say the facility provides a much needed break from traditional classroom learning. The project was funded by a $26,000 grant from the Chargers Champions Program. Chargers linebacker Kyle Emanuel was also at the school to try it out. The classroom is open to kids from 2nd to 5th grade.